Saumur is situated at the southern end of Anjou, at the confluence of the Thouet and the Loire Rivers, in an area of ancient settlement. Saumur dates back to the fourth century BC - it was created as a small village in ancient times called simply ‘Mur’ with people who lived in caves (called ‘habitations troglodytes’), dug along the sides of steep mountain ranges to the east of Saumur. Although best known for the Chateau de Saumur, this attractively located town has other attractions that will also detain you. 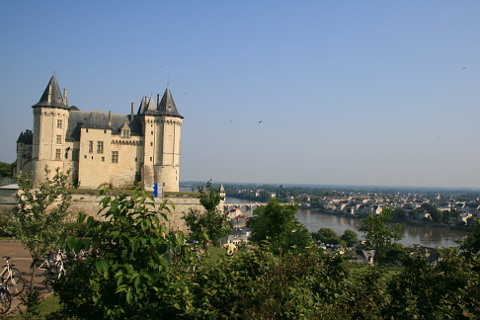 Saumur is a very attractive town with its white stone buildings, grey slate rooves and riverside setting, all topped of course by its grand chateau set on a hill above the town. It is a lively shopping town and has lots of attractive streets to explore and several nice squares with cafes and restaurants that are charming places to stop for a drink or a meal. The Place Saint Pierre is particularly attractive with the imposing church of Saint Pierre which dates to the 12 and 13th centuries and contains some lovely stained glass windows. Also on the square are some attractive half-timber buildings from the 15 and 16th centuries. 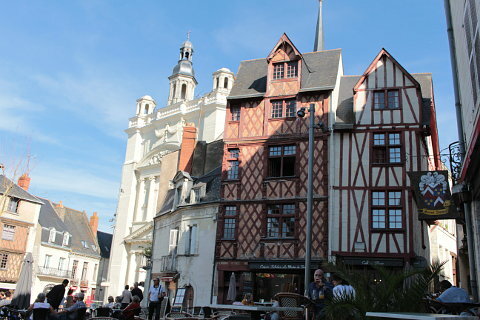 If you head uphill from here on the 'Montée du Forté you get to some more charming half-timber buildings. One of these, the Maison des Compagnons was built in the 15th century and is the last of the medieval buildings that was built inside the fortified walls that once surrounded the castle. 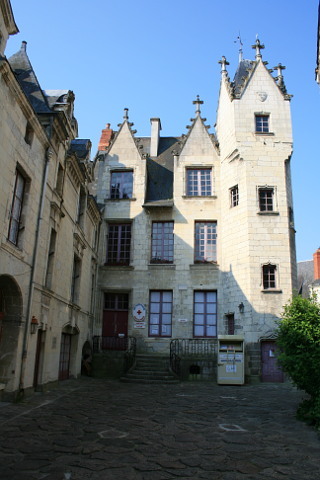 One of the key buildings of Saumur is the Maison du Roi (House of the king) which was built in the 15th century. It is a beautiful building and has housed various kings and queens in its time including Charles VII, Henri IV, Louis XIII, Marie de Medicis and the queen mother Anne of Austria. There are a number of elegant mansions in Saumur. 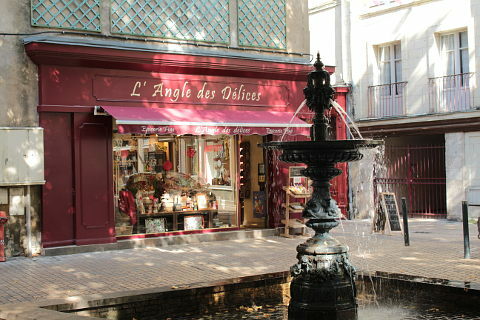 The Maison des Anges on Rue Fourrier was built in the 17th century and has cherubs decorating its facade. The Hôtel du Belvédère on Quai Mauaud was originally a hotel for travellers. It has a fine neo-classical facade and and a belvedere offering it great views over the river. The Rue du Temple has a few fine manor houses and the 17th century Hôtel de Sourdé is one of the best. 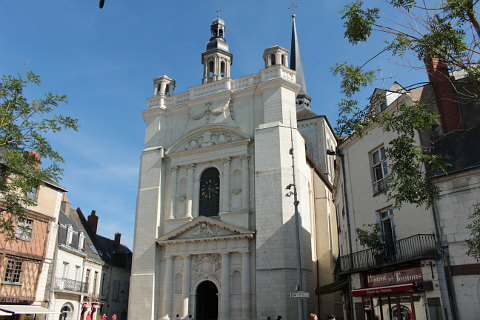 Among the religious buildings to visit in Saumur are the Chapelle royale Notre Dame des Ardilliers (XIV century), a pilgrimage destination for many centuries. It is a large and beautiful church with a façade adorned with porticos and illuminated from inside by large windows. Also the church of Nantilly (XII century), the oldest in Saumur and in the Romanesque style, with a remarkable collection of tapestries from the 16th and 18th centuries. 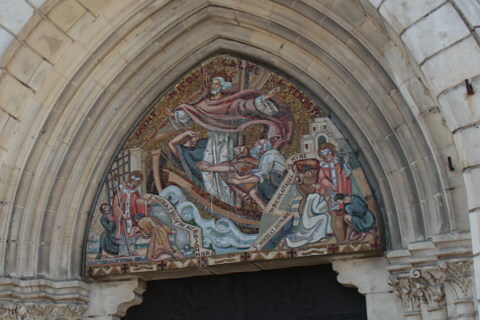 The church of Saint Nicolas has a lovely mosaic on its main doorway which is new and has been raised to avoid flooding. 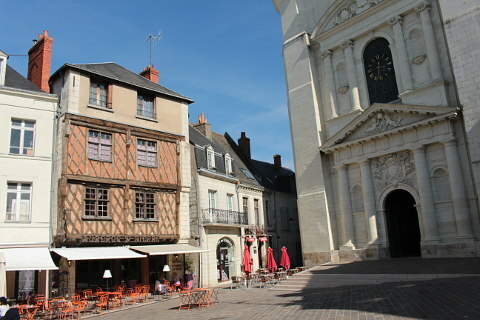 Other highlights include the 18th century Hôtel Blancer with a Louis XVI facade, the imposing 15th century town hall, the Papegault tower which was once part of the 15th century town walls. It once had a wooden parrot on the top which was there as target practice for the archers. Another renowned institution of Saumur is its riding school, founded in 1771 with the task of training officers. It was moved to Versailles in 1822, but in 1824 it was back to Saumur, where it still exists, making the city one of the main centres of riding around France, where horses follow a standardized training that lasts five years. The school conceived a horse show, the ‘Cadre Noir’, so called because the Knights (officers and NCOs) wear a completely black uniform and gold spurs. The show consists of displays in which the rider controls the horse from the ground using long reins. In addition to his riding school, Saumur is now famous for another institution, namely its ‘Musée des blindés’ (Museum of arms), which preserves valuable collections of tanks, cannons and other vintage vehicles. A visit to Saumur is also an excellent opportunity to try the typical local cuisine particularly ‘fouées’ ( a kind of bread stuffed usually with goats cheese or pork), eels, ‘galipettes’ ( stuffed mushrooms) accompanied by the ‘Saumur Champigny’, rightly considered the best red wine of the Loire. The ‘Mur’ part of the name of the town probably derives from the fact that the caves and hills have the form of a ‘compact wall’; indeed, a real ‘defensive rampart,’ (from the Latin word ‘murus’ which not only means 'wall’, but also ‘bulwark’ suitable for defence). In its early history Saumur passed under the dominion of the Romans, Visigoths, and finally to the Kings of France, Dagobert (603-639) and Pippin (714-768), who, in the mid-eighth century, came here to build a church dedicated to St. John. Given the defensible position they also built a castle, which was called ‘The Trunk’, because, seen from afar, the tower looked like a tree trunk. A village of huts developed around the church of Saint John, which was called ‘Johannis Villa’, in honour of the saint to whom the church was dedicated. With the Norman invasion, the inhabitants abandoned the ‘Villa’ to flee inland, but from the 10th century the village was repopulated again, taking the name of ‘Saulmeur’ and ‘Saumeur’, which means ‘Under the wall’, from which the present name of the city is derived (named for the new fortifications that were built around the church and convent for fear of further Norman raids). In the eleventh century, Saumur was hotly contested by the Counts of Blois and Anjou, until in 1025 the Count of Anjou, ‘Fulk the Black’ (972-1040), occupied the city. Certainly the most difficult years were those of the Wars of Religion. 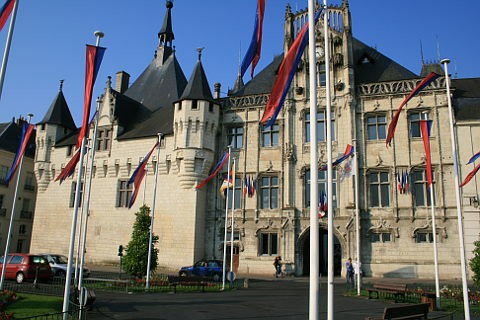 The rich bourgeoisie of Saumur had welcomed the ideas of John Calvin (1509-1564), which took root deeply in the city, leading to bitter religious strife between Catholics and Protestants. After the revocation of the Edict of Nantes in 1685 a large number of Protestants left the city, and the population was nearly halved, while the economic activities were severely affected. Saumur came out of the crisis under the reign of Louis XIV (1638-1715), and especially of Louis XV (1710-1774) with his school of chivalry which was founded in 1771 by Duke of Choiseul (1719-1785), the minister of Louis XV - with a particular responsibility to properly train the Cavalry officers. The city experienced another difficult time during the French Revolution, when it was besieged by troops from Vendée. 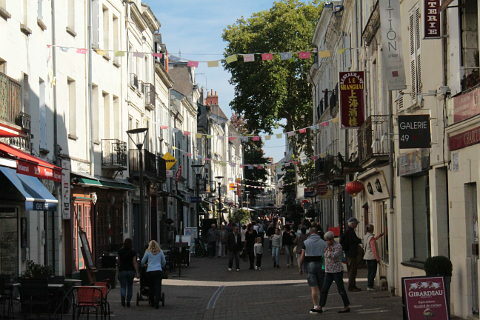 After the Napoleonic age and the Restoration (1814), Saumur became one of the most important cities for its cavalry school and for a number of economic activities related to agriculture and wine production. Nearby, the Abbey of Fontevraud (XII century) is very beautiful. It is built in Romanesque style and among the largest in Europe. In the Napoleonic era it was transformed into a prison, but today is home to important cultural conferences. Chinon is a very charming village and as well as Saumur and Blois makes for a good base when visiting the Loire Valley castles. The Chateau de Chinon is a huge medieval fortress. 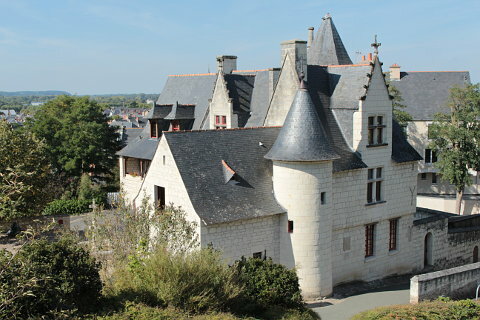 The nearby Chateau d'Usse is said to be the inspiration for the Sleeping Beauty fairytale. 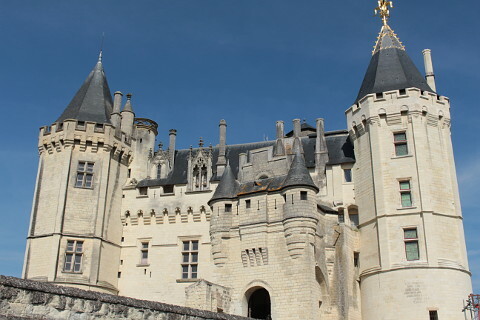 The Chateau de Saumur is one of the least striking of the Loire chateaux but sits above the pretty town of Saumur. 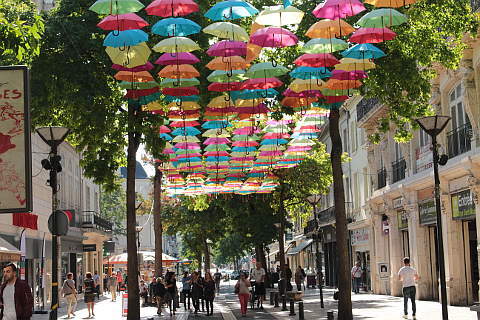 Montsoreau is a beautiful village with a castle, art gallery and mushroom caves to visit. Candes-Saint-Martin is a pretty village on the confluent of the rivers Loire and Vienne. Chinon is a beautiful little Loire Valley village dominated by its imposing fortress. The Chateau de Chinon retains more of its medieval characteristics than many of the other Loire chateaux which were redesigned in the Renaissance period. The Chateau d'Ussé is a very pretty chateau said to be the inspiration for the Sleeping Beauty fairy tale.